If you have any questions about the OBSESSION information page below please contact us. The motor yacht OBSESSION is a 55 metre 181 (foot) important aluminium superyacht which was fashioned by Oceanfast (Austal) and conceived in the office of Phil Curran and Bannenberg Designs Ltd. Accommodating 10 guests and 13 qualified crew, motor yacht OBSESSION was formerly Oceana C; Bolkiah I; Maalana; Oceana; True Blue. The firm of naval architecture which delivered this yacht's drawings for this ship was Phil Curran and Bannenberg Designs Ltd. 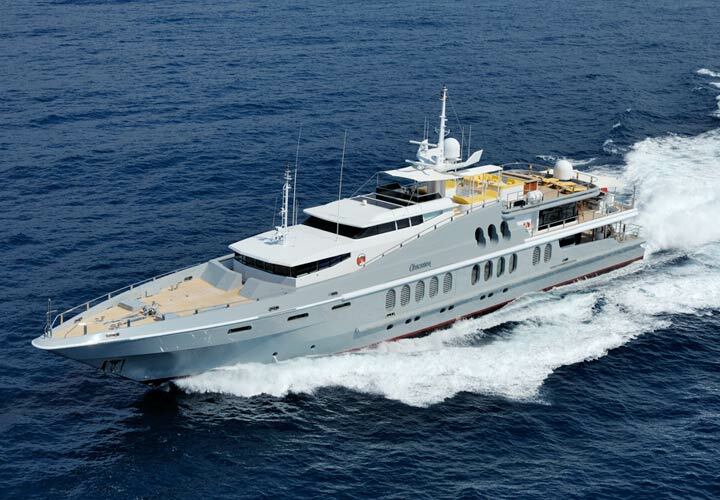 Moreover, her interior styling is sucessful creation of Bannenberg Designs Ltd.
Motor yacht Obsession has been well maintained and underwent a refit in both 1998 and 2007. Phil Curran was the naval architecture company involved in the professional nautical composition for OBSESSION. Her interior design was conceived by Bannenberg Designs Ltd. Phil Curran and Bannenberg Designs Ltd is also associated with the yacht general design work for this boat. Created by Oceanfast (Austal) the vessel was completed in the yacht producing country of Australia. She was successfully launched in Fremantle in 1991 before being transferred to the owner. A spacious area is manifested with a widest beam (width) of 9 m or 29.5 ft. With a 1.49m (4.9ft) draught (maximum depth) she is reasonably shallow. The material aluminium was used in the building of the hull of the motor yacht. Her superstructure over the hull is created from aluminiumandgrp. In 2008 extra refit work and modernisation was also finished. Powered by two MTU diesel engines, OBSESSION can reach a maximum speed of 22 knots. She is driven by twin water jets (kamewa). She also has an economical range of 2100 miles when sailing at her cruising speed of 18 knots. Her total HP is 6960 HP and her total Kilowatts are 5121. Regarding bow thruster maneuverability she uses Richfield. 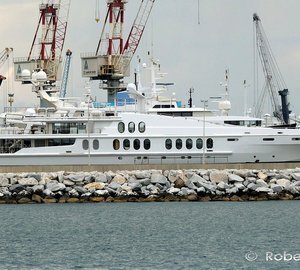 As for the yacht’s stabalisers she was built with Koopnautic. 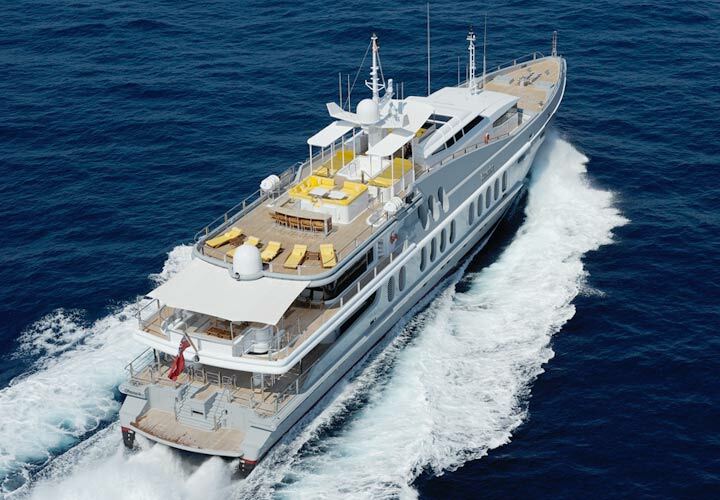 The large luxury yacht motor yacht OBSESSION is able to sleep up to 10 passengers in addition to 13 crew. 55 metres / 180.5 feet. The propulsion comes from two 3480 Horse Power or 2561 kW MTU. The Model type is 16V 396 TB94 diesel. Total engine power output 6960 HP /5121 KW. Cruising at a speed of 18 knots. Range in nautical Miles is 2100 at a speed of 15 knots. Mtu 2 times 149 kilowatts, Volvo Penta 1 times 125 kilowatts. Around Sept 2009 OBSESSION went to Cannes, in France. OBSESSION has traveled the area encompassing Département des Alpes-Maritimes during the month of October 2009. OBSESSION features a teak deck. The luxury yacht OBSESSION displayed on this page is merely informational and she is not necessarily available for yacht charter or for sale, nor is she represented or marketed in anyway by CharterWorld. This web page and the superyacht information contained herein is not contractual. All yacht specifications and informations are displayed in good faith but CharterWorld does not warrant or assume any legal liability or responsibility for the current accuracy, completeness, validity, or usefulness of any superyacht information and/or images displayed. All boat information is subject to change without prior notice and may not be current. Hi Amanda We had a fabulous time. Arno and Petra were terrific. They really accommodated all of our needs/interests…. The food was really great - Petra is a great cook, and as you know, Arno has a keen hand for baking bread. I would definitely recommend Obsession for others interested in cruising in this area. The boat is very comfortable and really has the perfect layout, with lots of outdoor space - both covered and exposed to the sun - so you can have what you want. The rooms were all comfortable, with plenty of space for storing clothing/luggage, and the bathrooms were very nice/comfortable as well. My brother had plenty of opportunity to fish and the rest of us had lots of swimming/snorkeling time. All in all, a great trip. My mother was/is very glad we did it. Thanks for your help throughout the process! R.L chartered MY OBSESSION in the Caribbean Virgin Islands in Dec.